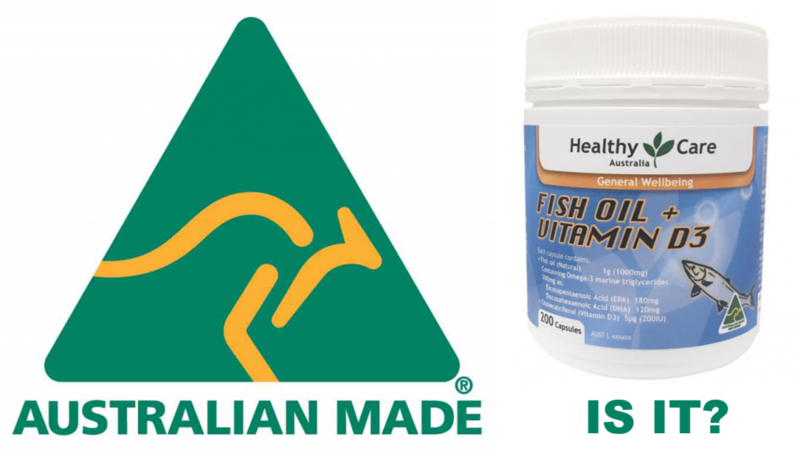 On 3 December 2018 the Federal Court ruled that encapsulation in Australia of imported fish oil (from Chile) and Vitamin D (from China) did not qualify for the ‘Made in Australia’ logo. The ACCC welcomed the Federal Court ruling that Nature’s Care Fish Oil 1000 + Vitamin D3 soft gel capsule (branded as Healthy care) will not be allowed to be labelled ‘Made in Australia’ under the Australian Consumer Law’s (ACL) Country of Origin labeling provisions. The ACCC said it provided evidence to support its view, consistent with its published guidance, that encapsulation and the addition of a vitamin should not be considered a ‘substantial transformation’ of imported ingredients. Complementary Medicines Australia (CMA) CEO Carl Gibson said the government needed to act immediately to protect the billion export market which was now under threat. The ‘Made in Australia’ logo is a key marketing element for many territories, particularly China, with some estimates that complementary medicines have an export value of $5 billion per year. “We are one of the few manufacturing sectors in the country actually growing – and yet Australia is about to shoot itself in the foot and give away our competitive export advantage,” he said, saying the case outcome underlined “how Australian companies are being negatively impacted by the new ACCC guidelines”. My own view is that CMA are essentially saying they will lose money if they stop misleading consumers about their labeling and obey Australian Consumer Law. Which would also happen if they stopped misleading consumers about the claims made for their products and obeyed the Therapeutic Goods Advertising Code! On 5 December 2018 the Minister for Industry, Science and Technology, Karen Andrews, announced the Complementary Medicine Taskforce to review the impact of recent consumer law changes on the complementary healthcare sector. “The Morrison Government is committed to helping local industry tap into our export markets, and ensuring our business community has opportunities to sell more products overseas,” Minister Andrews said. The Taskforce will consider and assess reported impacts on the Sector of the changes to the substantial transformation test under the ACL. Both industry and consumer interests will be considered in this process. The Department of Industry will provide the Chair and Secretariat for the Taskforce. The Terms of Reference are available. The Taskforce will provide advice to Government by the end of February 2019. The Complementary Medicine Taskforce: A Homeopathic Consultation? 17/02/2019: I was asked to present a consumer perspective (on behalf of Choice) and other perspectives (PHAA, HAIAP & FSM) to the Taskforce in Canberra on 31 January 2019. My presentation is now available. Then they wanted a written submission! The Consumers Health Forum also presented to the Taskforce and made a written submission. We both said that research showed that consumers wanted to know the origin of ingredients in products they were considering purchasing. 05/04/2019: Media Release by Minister for Industry, Science and Technology Karen Andrews: Backing the complementary healthcare industry. The Coalition Government has supported the complementary medicines industry and agreed to water down the ACCC’s “Made in Australia” criteria for country of origin labeling. 05/04/2019: Media Release by Shadow Minister for Industry, Science and Technology, Senator Kim Carr: Industry Minister must act, not just talk, to fix complementary medicine crisis. The announcement comes as the Morrison Government is about to cross the threshold from unofficial nightwatchman government to official caretaker government. It is my understanding that these changes will have to be implemented by legislation or regulation so, no action can take place until after a new government is elected. This entry was posted in Advertising, Medicine policy and tagged ACCC, Australian Consumer Law, Australian Made, Carl Gibson, Complementary Medicines Australia, Complementary Medicines Taskforce, Country of Origin Labels, Department of Industry, Justice Perram, Karen Andrews, Kim Carr, Substantial transformation. Bookmark the permalink.